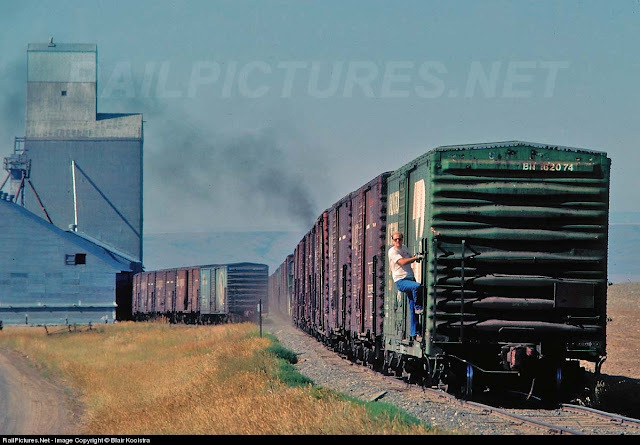 Blair says: "The eastbound Withrow turn departs Supplee, Washington, with the brakeman "riding the point" the final few miles to the elevator at Withrow. The train arrived at Supplee to find loaded grain boxes shoved out to foul the main track; a pull and a cut and nose onto the loads, and they're off at 10mph to the next stop with the loads being shoved ahead of the two GP9's. Pure branchline railroading!"